The Milton H. Erickson Foundation organized the first Evolution of Psychotherapy Conference in 1985 in Phoenix. It was hailed as a landmark conference in the history of psychotherapy. Faculty included Beck, the late Bruno Bettleheim, the late Murray Bowen, Ellis, M. Goulding, the late Robert Goulding, Haley, the late Ronald D. Laing, Lazarus, Madanes, Marmor, Masterson, the late Rollo May, Minuchin, Moreno, E. Polster, the late Miriam Polster, the late Carl Rogers, Rossi, the late Virginia Satir, Szasz, Watzlawick, the late Carl Whitaker, the late Lewis Walberg, the late Joseph Wolpe and Zeig. This conference was repeated in 1990 in Anaheim, Calif., with a similar faculty including Bugental, Glasser, Hillman, the late Helen Singer Kaplan, Lowen, Meichenbaum and the late Mara Selvini Palazzoli. Keynote addresses were given by the late Viktor Frankl and Betty Friedan. The Erickson Foundation jointly sponsored the European Evolution of Psychotherapy Conference, July 27-31, 1994, in Hamburg, Germany. This Conference offered a faculty similar to previous Evolution meetings with the addition of Frankl, Gendlin, Grawe, Kernberg, Meyer, Stierlin and Yalom. The December 1995 Evolution of Psychotherapy Conference was held in Las Vegas, Nev., and featured the same faculty. Gloria Steinem offered the keynote address. 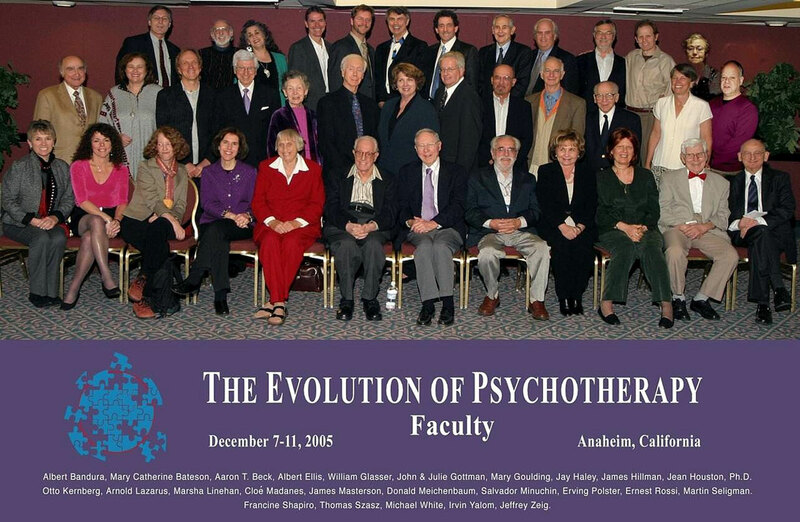 The Evolution of Psychotherapy Conference returned to Anaheim, Calif. for the May 2000 Conference. Keynotes were given by Elliot Aronson and Herbert Benson. The program for this landmark Conference is designed to maximize the opportunity for interaction among the faculty and between the faculty and participants. Presentations will include Invited Addresses, Workshops, Clinical Presentations, Dialogues, Panels, Conversation Hours and Keynote Addresses. The State of the Art faculty will introduce the participant to different viewpoints and ideas through Workshops and Addresses.